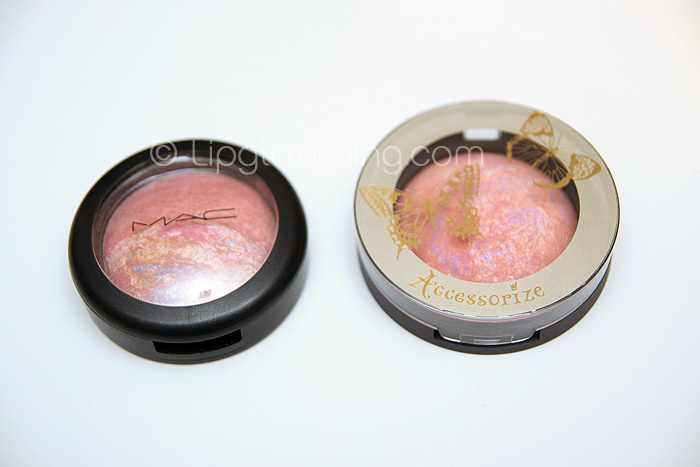 As soon as I saw the veining in one of the latest Accessorize Merged Blushers… I knew I’d seen it before. I didn’t even really want the shade but my curiosity got the better of me, so I picked it up along with the rest of my little haul yesterday afternoon. On the way home, the penny dropped and I dug out my discontinued MAC Moon River mineralize Blush. 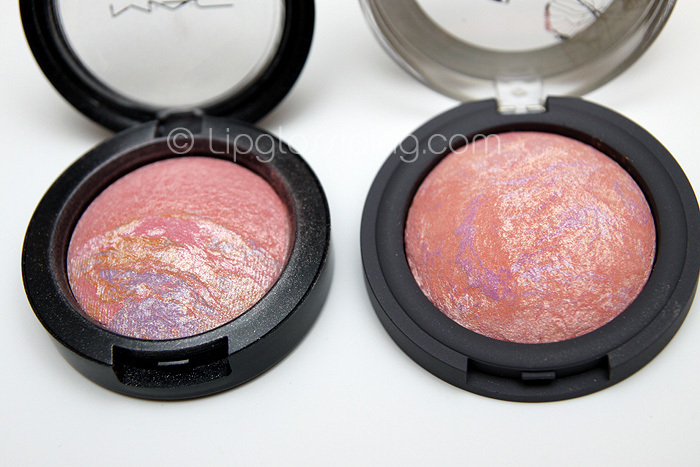 MAC Moon River mineralize blush was released as part of the Grand Duo collection in Spring ’09 and has recently been spotted in a few CCO’s up and down the country. It’s a particular favourite amongst pale skin types who just want a hint of colour. Compared to Accessorize’s Merged Blushed in #3 Pretty Pink, first impressions as a dupe possibility are promising. The veining is simillar: Pink, Lilac and Soft Yellow. Accessorize’s offering looks slightly less glittery in the pan and also just a hint warmer/peachier. Accessorize gives us 8g of product for £5.50 compared to MAC’s 3.2g of product for around £17.50. MAC on the left, Accessorize on the right. Are you seeing dupes? Obviously… Accessorize Pretty Pink isn’t a duo… the veining is consistent throughout the pan. Do you agree that Pretty Pink looks a little warmer than Moon River? Moon River feels a little softer and my brush picks up the powder more readily when swept over Moon River. Despite this, pigmentation is pretty simillar. I’d say that Moon River appears to be more glittery than Pretty Pink, though strangely the sheen on the Accessorize dupe is a little more apparent…. a touch more ‘metallic’ once on the skin. The most important swatches are the two on the left. I added the third just to show the marbled half of Moon River alone. 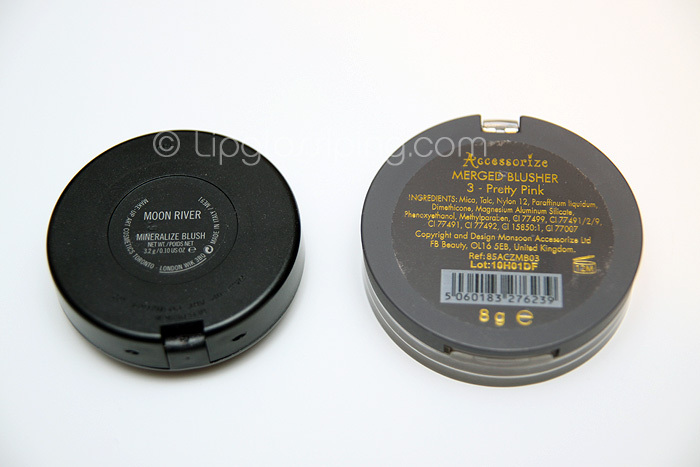 MAC Moon River vs. Accessorize #3 Pretty Pink – Dupe or no dupe? 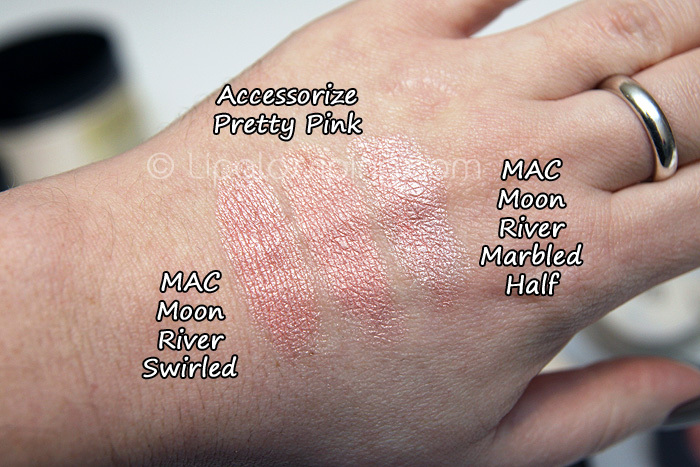 MAC Moon River vs. Accessorize #3 Pretty Pink - Dupes? A DUPE if ever I saw one! No way is that a DUPE! - Are you blind? thank you very much for this post, they look incredibly similar on the skin! that looks like a really good dupe!! I’ll try it out though I haven’t looked at accessorize makeup yet. really eager to do so though! This is definitely a pretty good dupe – do you know if Accessorize sell make up in their Irish stores please? I thought that too when I saw a pic of it but I can’t find it ANYWHERE! argh! I actually prefer “pretty pink” to the moon river. It actually looks slightly warmer. Could be just me though.. I’m rather special like that. Keep an eye out in Superdrug if you buy this – the shelf price says £5.00 and it comes through the till at £5.50! I got my 50p refunded but how many people have paid more than the shelf price for this? UGH! I woulda paid £5.50 for both of mine then :/ Thanks for the heads up. But does ‘Pretty Pink’ have the same lasting power as ‘Moon River’ ? Great swatches. I have never heard of the brand Accessorize in the states. Probably had to find it on ebay.